Whether you own an ice-cream shop on the Jersey shore, a ski shop in the mountains of Colorado, or a landscaping business in central Minnesota, you’ve experienced the challenges of the dreaded off-season. After your peak season ends, a stretch of slow business begins, and your website and store front become ghost towns. Plus, who's to say this season's customers will remember you when the next season rolls around? It's a bummer of a thought, to be sure. 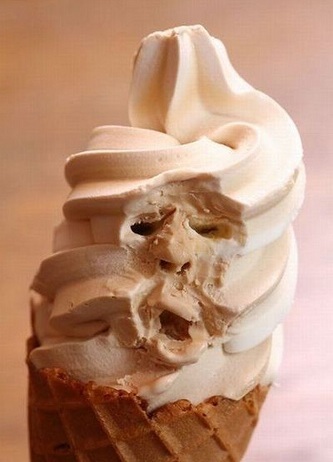 But don’t let the seasonal slumps get you down! Instead of sitting around and waiting for your season to start again, use this valuable time for marketing! That's right, seasonal marketers that think long-term and use their off-season time wisely can help tee their businesses up for smashing successes when peak season begins again. Here's what you should be thinking about to keep your business on people's minds year round. During your peak season, your website and location (if you have one) will be abuzz. So while you’re doing business as usual -- or running around like a chicken with your head cut off, as the case may be -- be cognizant of the opportunity you have right now to grow your database. You know, while everyone is around. Getting a strong list of past customers and people who've expressed interest in your business will enable you to stay top of mind during the off-season, and convert new leads into customers during your next season. Make sure your website has plenty of calls-to-action (CTAs) for people to stay in touch with you by subscribing to an email list or a blog, and even some offers that they can redeem for staying a loyal customer of yours, off-season or not. Some ideal places for these CTAs are your blog, your homepage, your product/service pages, your resource center, and in your social profiles. Remember, growing this list is so much easier when you have plenty of traffic, so while it may seem daunting to add database growth to your ever-expanding list of peak season to-dos, your off-season success hinges on your productivity during this time. During your entire season, but particularly as your season comes to an end (and heck, even after it has wrapped up entirely), you should be asking your customers to review your products or services. By gathering customer stories and testimonials when they’re still fresh, you'll have reviews that are more detailed and personal that'll resonate with off-season readers. Think about it -- imagine waiting for the train on a blistery, snowy day, and thinking about the summer when you were waiting for this exact same train with a delicious sno-cone from Annie's Summer Shack. With a sense of nostalgia a-brewin', you Google Annie's Summer Shack to see what they're up to during the off-season, and to figure out when they'll be open again for sno-cone goodness. And up pops, hopefully, a ton of nostalgia-inducing reviews from happy patrons that have enjoyed Annie's fare in years past. That's the kind of feeling you want to elicit from customers during the off-season, and the best way to get it is through customer reviews! Use those stories in your off-season email marketing, blog posts, website pages, and social media updates -- in all your off-season promotions. For an extra boost, ask customers to submit pictures and videos from their experience with your business, or you could even ask to video them for a case study. The more raw and interesting content you can get from your customers, the better your off-season marketing campaigns will be. If you'd like more help collecting awesome online reviews, read this blog post that will walk you through the process. Just because your target audience can't utilize your products or services right this very minute, doesn't mean they won't benefit from and be interested in the information you have to give. If you create helpful content of this nature that speaks to your target persona, you'll build solid relationships via your content that will sustain during the off-season, and bridge into your peak season ... bringing in not only familiar faces, but new faces with whom you've gained a following because of your fantastic content. Your customers don’t vaporize during the off-season. It’s important to stay in contact with leads and past customers throughout the entire year. Consider social media your virtual, year-round storefront -- because even if your audience isn't chillin' outside your store or visiting your website, they are certainly perusing their social media feeds! That means your business should consider leveraging Facebook, Twitter, LinkedIn, Pinterest, the whoooole shebang to stay top of mind year-round. You should be using this real estate to offer special discounts, gather (and publish) reviews and testimonials, share the new content you're publishing, run contests and polls, and generate hype for the next season. 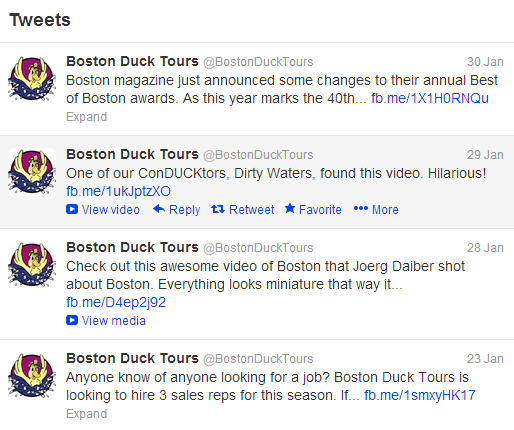 Here, just take a look at Boston Duck Tour's Twitter presence to get an idea of the mix of content you could be sharing, even when you're temporarily closed for business. They're publishing the kind of content that their target persona will want to read -- stuff about Boston -- and preparing for their new season by generating hype and even doing a little recruiting! Remember, people are planning ahead earlier than ever nowadays for purchases, trips, and activities. If you're in front of people's eyeballs months in advance, you could be the one who sparks their interest in that summer trip to Boston they forgot they wanted to plan ... and might even be that first pit stop they make when they land! 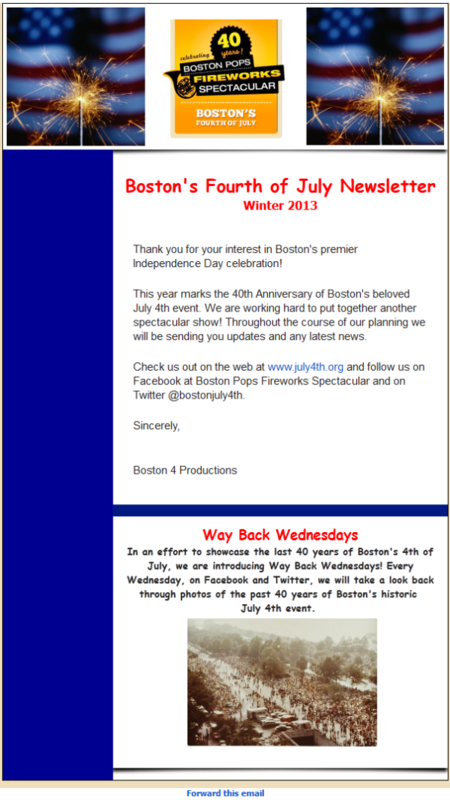 What's great about this email is that it serves as a reminder to check in with their content, and to connect with them socially -- and even displays the value of that connection by showcasing their Way Back Wednesday content. This is a fantastic way to establish loyalty with your current audience, and help grow your audience during the off-season. Just because people can't snowshoe in the summer, or you have a smaller audience looking to wear your trendy sun hats in the dead of winter, doesn't mean you can't get people excited about your business. When it's 90 degrees out and people are hiding in the shade dreaming of cooler days, what better time to kick off a snowshoe sale? And on the flip side, I challenge you to find anyone embroiled in a blistery snow storm that isn't trudging through the slush, thinking of when it'll be warm enough to have to pop on one of your trendy sun hats. If your content plays upon the excitement of things to come -- by providing early bird offers, off-season discounts, that sort of thing -- you can bet you'll have an audience excitedly planning for the time they can take advantage of your products and services again! In order to keep things steady during your slower months, consider focusing on a niche market with whom your products or services could be a huge benefit. For example, if you run a bakery that experiences frequent peaks and valleys throughout the year, try marketing yourself to a gluten-free or sugar-free crowd. Specializing with these markets will give you an edge that not as many competitors can leverage, making you the stand-out business in your industry and giving that niche market even more reason to come and see you. This doesn't mean you start marketing yourself as a purveyor of sugar- and gluten-free products exclusively, but it does mean you start blogging about some of the tricks of the trade, sharing social media updates with pictures of delicious sugar-and gluten-free treats, pinning pictures of custom birthday cakes you've done for customers with special dietary needs, and emailing special offers for people with gluten- and sugar-free diets to come in for a special tasting event just for them. Locals deserve a lot of love, especially when they're living in areas that get periodically overrun with tourists. When your leaf peepers, skiers, or beach bums pack up and leave town, you’ll have to rely on the locals to keep your business afloat. By offering discounts to people in the area, you can still bring in some business after the crowds disperse -- and maintain a good relationship with the folks that are there to support you throughout the entire year. For example, Big Bottom Market, a specialty food story in Guerneville, California survives their slow months of October through April by adapting their marketing efforts to target local residents instead of seasonal tourists. To stay within the average local resident's budget, they revamp their wine inventory by marking down high-priced wines and then restocking with wines around $12-$15 instead of the usual $30-$40 wine sold during their tourist season. They also market directly to the Guerneville residents by creating a new sandwich each month for an outstanding local resident, and holding a Thursday Community Day where everything in the store is 15% off. Focusing on your local community during your off-season is vital; if your locals embrace and support your business, your slow months are sure to be less of a struggle. What other tips do you have for seasonal marketers? Share your advice in the comments!